Opera does not allow us to create a search engine or change your homepage. You can use the one provided by the extension by typing "q" followed by your query. Qwant is the leading European privacy-first search engine which offers great quality results in a friendly environment. 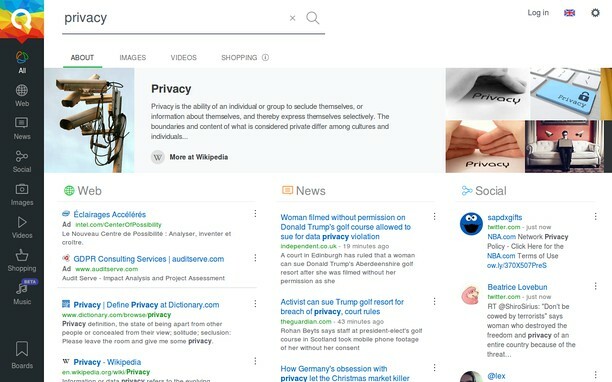 This browser extension will simply set Qwant as your main search engine and start page, so that you can enjoy our great results while protecting your privacy. With Qwant, you will find whatever you want on the Web in a few seconds without ever being tracked: we don't keep any history of your search queries, we don't put any cookie or tracker on your browser, and we don't share your personal data to advertisers. We never will. Just open a new Qwant tab or use your address bar, tell us what you are looking for, and the most relevant results will be displayed in no time. Refine your search to see specific results extracted from social networks, images, newspapers, videos, music, shopping, etc.